Hello,I plan to visit a relative of my bf, this weekend and I though about cemetery conjure, meaning I want to get the rules right so I don't bring anyone home with me. Ok his daughter just got married and I thought about bringing a photo to put at his grave as well as his favorite drink and candy.now can I do this, can I leave this there and will this curse or bury my guy and his family in the cemetery? Or is this harmless.I'm not taking grave dirt, but I read that you pay 9 pennies at the gate to the gate keeper so that you don't have any spirits follow you home.and since it's me and him going do I leave 18 pennies instead?I don't want to mess this up, is this the right process?I feel it is but need to be sure. First of all, it appears that you were not reading this website abut it. Sounds like you were reading a Santeria website where one leaves 9 pennies to the Orisha (Mama) Oya. I don't know if I would personally leave a photo. I would, instead, bring the photo for the deceased to see and then bring it back with me. Show the photo and give something in the behalf of the people in the picture and then give an offering on their behalf. I am merging your post over to the subforum on graveyard dirt as there are a few similar questions. And, read about offerings on the page that I gave you. Don't be hesitant! Graveyards are fun. Especially when you're with the spirit of the one you are visiting. It can be a happy place with a happy reunion. Make sure that you cleanse yourself after you give the offering. I like to put Florida Water on myself when leaving the grave site. But, you might have to do a complete spiritual cleansing if this doesn't work. Thank you Miss Aida. Should I just leave an offering at the entrance or try to find the spot where I took the dirt? I don't remember exactly but I could probably find the vicinity. This is a VERY large cemetery in the hills of Oakland, CA. While the spirit might not be directly punishing me for my ignorance, I believe my problems with depression and my family history of spiritual oppression/curses makes me an easy target for a restless or unhappy spirit. I've always felt this and I had many strange childhood encounters that confirm this suspicion. Thanks again for your great advice and patience with this fumbling novice! I will do exactly as you suggested and follow up here. Luckily, I have a healthy arsenal of spiritual supplies from all my recent visits to Lucky Mojo. Should I douse myself with fiery wall of protection oil before going to the cemetery as well? I suspect I may need some professional rootwork on this matter if I still feel unsettled after paying my respects with an offering and cleansing with 13 herb bath. Oye vey. Is wine an acceptable offering or does it need to be liquor? Because you don't know what the Spirit likes, I would leave a dime at the grave site and explain as Miss Aida has said above. Yes, I would dress with Fiery Wall of Protection Oil before going in the cemetery. Thanks Melanie. Since I don't remember which area I took the dirt from, can I choose any grave in the general vicinity? I didn't take it from a specific gravesite. Or maybe I can leave 3 dimes at the gate for the gatekeeper? I just got back from the cemetery. I did as Miss Aida instructed and asked the spirit to follow me there. I announced myself to the gatekeeper on the way in and apologized for my previous disrespect. I found the general vicinity of where I took the dirt and put flowers, 3 dimes and a swig of whiskey at a gravesite. I chose a woman who lived a really long time and had a positive message of strength on her gravestone. I'm hoping her strong spirit will help counteract some of the negativity I've been feeling. I also left 3 dimes for the gatekeeper, apologized again on my way out and asked the spirit to stay behind. I'm going to take a 13 herb bath now and hope for the best. According to my pendulum the spirit is still here and I do still feel a presence. Burning camphor right now. Are you experienced with the pendulum? Anyway, you might have to do a complete uncrossing for this. Not experienced enough. I did a $10 yes/no reading with ConjureMan Ali and he said the spirit didn't follow me home. Big relief. But... I'm very glad I followed your directions and went the cemetery to correct my disrespect. I'm now committed to not doing any heavy work or negative work until I'm much more experienced. It gives me anxiety, but I think when I have a better understanding of hoodoo spiritual principles, I won't be so conflicted. Thanks Miss Aida for all your great advice. ConjureMan Ali did say I need a good cleansing of myself and my home. Maybe the presence I was feeling was all the residual emotional junk left over from my breakdown. Is Chinese Wash on the floors and sage smudging enough for the house or do I need to do more? I will probably start out with a good mundane professional cleaning. I thought about hiring Ms. Robin to do a spiritual cleansing (she's in Berkeley), but I don't know if that's necessary. I think a good physical and spiritual cleansing is a great idea and if you are inexperienced there is nothing wrong with hiring someone to come in and help coach you through it!. Chinese Wash is an excellent cleanser and you can use sage in that way to but you might also try some Van Van incense. green paper, vandal root and graveyard dirt -wrap it up and put it under your bed for how long ? Please tell us what you're referring to. I read about a love spell using these items but it didn't say how long to keep it under ur bed. Also can it be put between the mattress and box due to cats or does it have to be on the floor under the bed. And yes, you can put it in between the mattress and pad. I am hoping to buy some graveyard dirt from my late grandmothers grave. We were very close, so I feel confident that she will help me with my work. I have read about the usual process on the forum, but I just wanted to check. Am I right in thinking I should go to her grave, ask her permission for the dirt, explain what it is for, then pay and thank her? My grandmother was an extremely kind and generous lady and she didn't like to accept things from people, she loved to give to others, so I'm not quite sure how to pay her. Would coins be alright? In addition to the excellent advice of MoonBreath, Some people take a small white candle and sit there while the candle is lit for the spirits to enjoy it. hello im sammie I have too many questions,but I only have one that concerns me dearly. I just recently got my cards read and a cleansing. I am new to this and first time user of this. however I am captured by all of it and would like to learn more. the gentleman who helped me said something about cemetery dirt at the entrance of my home. and the candle he blessed for me burned gray. a frost sort of. can you give me any advice. Could you give a bit more info on the candle? You say it burned grey - like frost ... I assume you mean white soot formed on the glass? Where was this soot? Only on the top part? All the way down? On one side? Only at the bottom? Also, what was the purpose of the candle???? Uncrossing? Blessing? Also, where were you instructed to get the graveyard dirt from??? The grave of a relative? A child? A soldier???? I would think the person who did this work would explain it more to you; but more information would be helpful to us on the forum. sammie2015, As MoonBreath said, we cannot answer the question. You hired the card reader and helper. Ask him what he meant. I do know that graveyard dirt from a strong relative can protect your home. That may be what he meant. the candle was an open passages candle or a open road candle. as I got my cards read I was looking for some guidance. I was feeling trapped. he said that the person was using some sort of spell cause I felt as if my feet where tied. when I did get my cleansing I felt when he got to my head he was pulling up and something inside was pulling down. I do feel better than before I got my cleansing. about the dirt he said someone was throwing cemerty dirt or something at my home as if they wanted all bad things to happen. And happy that your cleansing went well. thank u miss ada and I will. Hi, I don't know if I post on the right forum but I have a question. Were we live security is very strict at graveyards because satanists used to hold their rituals there and then vandalized the graves. It is very difficult to gain access to a graveyard. Can I maybe use dirt from our beloved dead dog's make shift grave in the back yard. Or must it be dirt from a graveyard per say? Yes, you can use that for certain things. But, if this were me, I'd go to a different cemetery. If you're just looking for dirt, I really doubt that anyone will stop you. Just bring flowers and pretend that you are giving them to someone. Cemeteries are open to the public. I can't imagine that they would stop everybody and ask who they are seeing. I did the green letter graveyard dirt love spell years ago. It was recently removed from under the mattress while repairs being done in my room. How do I go about renewing it? It's cinched closed with a red ribbon, and I don't have any more green paper. Can I simply pray over the closed packet and sprinkle with more gy dirt? Does it have to be completely re-done? Should I pass it through some kind of cleansing incense smoke? Or touch it lightly with some florida water on my hands? If this were me, I would re-do it. Sorry. I'm feeling the same as Athena K, but if you work with a Pendulum, or such tools, you can always hold it over the packet and ask your spirits. Best of luck to you. Thank you, Papa Newt and Athena. You're both right. St. Cyprian via my pendulum says I need to do it over. I think I will redo the paper and writing, and just mix some new graveyard dirt and vandal root in with the old. I don't want to get rid of the gy dirt for some reason- It's my grandma's. I'm also going to re-use the red ribbon after I dab it with a bit of holy water. Thanks again! I hope this is the right place to ask these questions. I did a search and couldn't find the answers. I will be doing the spell involving the green paper, vandal root and graveyard dirt from my father's grave. 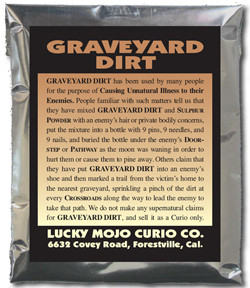 I read somewhere that I should add more graveyard dirt to the packet every so often. Is this correct? If so, how often should I add more dirt? Also, as for writing both my intended and my own name on the green paper, how do you write the names? Do you write them like a name paper...his name 9 times with my name 9 times crossed over his? Should I write a "Love Me" petition circled around the names? Personally, I haven't had a need to add more dirt to the packet, it worked just fine for me from the start. However, nothing says you couldn't add more dirt to yours if you wish. If you feel the spell is waning, that would be a good time to replenish. Or else choose a regular interval that works for you and stick with it. And your petition sounds fine. Thank you so much, Miss Athena! I had another question about the vandal root, green paper, graveyard dirt spell if anyone would be so kind to answer. I am going to the cemetery tomorrow to collect graveyard dirt from my father's grave. My grandmother and grandfather are also buried there. My grandfather died when I was 1 year old, and my grandmother when I was 13, but she and I had a very close relationship. I was wondering if I should collect graveyard dirt from all three graves (keeping the dirt separate of course) and make 3 different packets for the vandal root spell. My thinking would be to have 3 spirits working on my target instead of just one. Would this be a good idea, or at least "couldn't hurt to try"? Or would it be wise to just stick with one spirit? You can certainly collect dirt from all three graves and use that in your ancestor work, or to add their combined energy to the vandal root spell (you can combine them into one packet if they are spirits that got along together well in this life. I have dirt from the grave of my two grandparents and uncle (they are buried together) and all three have worked very hard on my behalf. That's great to hear, Miss Athena! I got my Vandal root from LM today, so I'm anxious to collect the graveyard dirt tomorrow and get this spell started. If anyone would help me, I know my father and his parents would. I Need to find an alternative for graveyard dirt when in the cementary there are only elevated headstones,no dirt. You can buy this right from Lucky Mojo! I waiting your email Miss Aida for the readings. I had another question regarding using vandal root and graveyard dirt for forced love. I've done the green paper spell, however I've also read that it is good to get the vandal root and graveyard dirt mixture directly on your target. My question is, can the mixture of vandal root and graveyard dirt be dressed on the outside of an envelope like sachet powder? I know sachet powder will stick better to paper, even if it's not noticeable, than dirt will. But would the dirt and vandal root stick enough so that when the target touches the envelope they will get the mixture on them, even if it's a microscopic amount? I really want to get this stuff on my target, but the only means of direct contact that I have available at the moment is dressing the outside of his mail. Yes, you can use it like you would a sachet powder. It should work just as well. Id pray to grandma and ask her to bring him fully and sprinkle her grave dirt on him, yes though you can use another. Id get a personal item and put it in the honey jar and id also look into the rec kid sold by LM or come to me kit add his personal item. You got good movement so keep the work up till you get the full manifestation. try also feeding him some of your menstrual blood in his food which you prayed over calling him to love you. How would one do a spell to draw money and luck using graveyard dirt? I tried researching and nothing came up. I am sorry but I can't seem to find one. ONLY the spell to get money that was owed to you. Thank you for your reply. Where could I find that spell you are referring to? Also is there any specific curse, hes or revenge using graveyard dirt? I tried to look and I see that it can be used for those but no actual directions. As I have personally not tried this, I don't know what the strength of the dirt would be, but I do know of many rootworkers who do this. There is no harm in you trying! Grave dirt from ancestors who "died badly" -- were suicides, executed, or murdered -- is most often used in enemy work. However, I can't help but sympathize - usually - with those who were so beaten down as to take their own lives. You might research ancestor elevation work (which is part of the Espiritismo tradition). Once that is accomplished, you might be able to do sweeter work with their grave dirt. If you don't know, then don't work with it.